Old woman in Jodhpur, India is submitted to ‘Look Up’ on National Geographic. Kristian Bertel has contributed to the National Geographic Your Shot with an assignment called ‘Look Up’. Curated by Mae Jemison, an astronaut, engineer and educator she wants us to take a photo that conveys the intimate relationship between humanity, the Earth, the universe and the connecting sky. Whether in the sprawl of urban landscapes, rural villages or the barren desert, this task asks that we capture the feelings and awareness when we actively look up. As Mae is saying it: ”- Look Up is based on the idea that the simple act of looking up and sharing what we see and feel can help us, humans, regain a sense of self, place, belonging and responsibility in a world that is too large and too small, too noisy and too isolating, resource rich and resource limited, welcoming yet unforgiving of biophysical excesses. Day or night, dusk or dawn, cloudy or clear, the sky is the portal across the planet and beyond. From our homes on this amazing planet upon which we all came to life, we can see a universe almost infinitely larger than we can imagine. Being in space confirmed for me that both are part of us: the Earth and the greater universe. And across the globe, that which connects us one to each other, to the Earth and to the universe –is the sky” she says. In the field of astronomy, the sky is also called the celestial sphere. This is viewed from Earth’s surface as an abstract dome on which the Sun, stars, planets and Moon appear to be traveling. The celestial sphere is conventionally divided into designated areas called constellations. Usually, the term sky is used informally as the point of view from the Earth’s surface. However, the meaning and usage can vary and in some cases, such as in discussing the weather, the sky refers to only the lower, more dense portions of the atmosphere. In the submitted photo we see an elderly woman in the photograph. 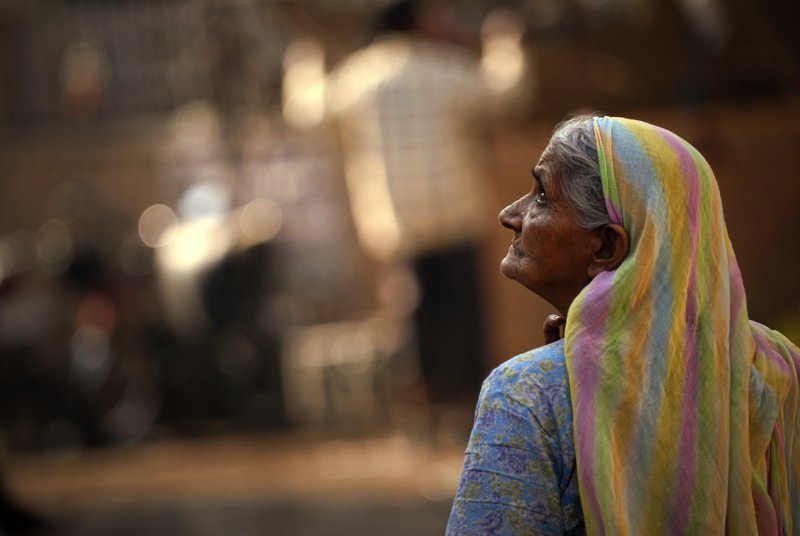 India has a population of approximate 60 million older women. In today’s fast paced modern life, younger generations hardly find time to share with their elders. It has been realised that ever-widening communication gap between the generations is also responsible for miserable condition of older women. In this photograph an old woman is looking up in the sky in the city of Jodhpur in Rajasthan, India. Maybe on the lookout for change. ”- In the Vaishnava traditions the highest heaven is Vaikuntha, which exists above the six heavenly Lokas and outside of the Mahat-tattva or mundane world. It’s where eternally liberated souls who have attained Moksha reside in eternal sublime beauty with Lakshmi and Narayana who is a manifestation of Vishnu”, the photographer Kristian Bertel says.